With the temperatures near 100 degrees, it's important to stay cool and hydrated. 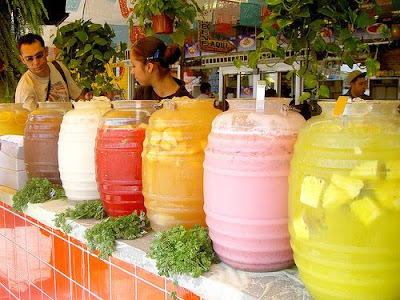 Aguas Frescas, fresh waters, are refreshing, light drinks that are a warm weather classic in Mexico. You can find these drinks everywhere from private homes to street vendors to upscale restaurants. The colors of the water look so pretty in clear glass containers and are elegant for parties and entertaining. The flavor possibilities are endless. Usually, I'll make a pitcher of whatever fruit I have in abundance. 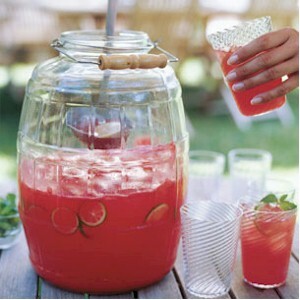 Some of my favorite flavors for aguas frescas are watermelon, cantaloupe, and strawberry. The key to a good drink is to have the light fruit flavor without having a drink that is the consistency of a smoothie. There is not an exact recipe for making aguas frescas, it's best to start blending the fruit, water, and sweetener and mix to taste. You can add sugar, agave nectar or honey to sweeten the drink. 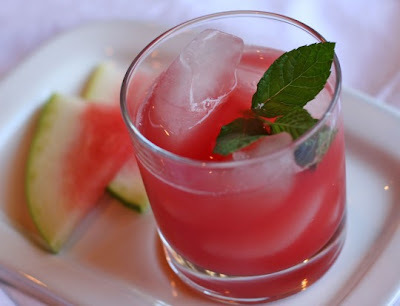 Here's a simple recipe for watermelon water, but again, you'll probably want to tweak the recipe to your taste. 1. Cut the watermelon into cubes or scoop with a melon baller. 2. Blend half the watermelon pieces with 1 cup of water until smooth in a blender. 3. Pour through a strainer into a pitcher to remove some of the pulp. You can skip this step, but I prefer less pulp in my water. 4. Repeat the process with the remaining watermelon and water. 5. Add in the lime juice and sugar to taste. 6. Serve with ice and garnish with a slice of lime or mint. When I was living in Mexico, we would prepare some water with leftover fruit that we had on hand. Always such a great treat. What kind of fruit would you use to make agua frecsa? I must try this...we drink tons of water so what a great way to add variety. I drink crystal light, so this will be fun. How much does it make? Sounds delicious. And oh so pretty. Thank you for sharing with us. Perfect for the summer! I will have to make some--thanks for sharing! They all look so delicious and refreshing. Mmmm. How fun-I may have to go to the Farmers Market and get some watermelon to try! Those sound delish! I have a watermelon in my kitchen right now. I may have to use it for this drink... sounds like it might be good as a "mommy drink too!" How cool are those drinks! The watermelon looks so refreshing! Thanks for the recipe! @Janice This will make a pitcher with about 6-8 glasses depending on how much ice you use. I like to fill the glass with a lot of ice. @Bevy It's easy to make this drink more "adult" and it's so yummy, too. Mmm this sounds delish! I think I'm going to make this for the 4th! That sounds so refreshing, natural and delicious! Thanks for sharing. I love agua fresca. Thanks for sharing how to make it! By the way, if you're ever on the Virginia side of the Beltway, La Sandia in Tysons Corner makes a refreshing watermelon Agua Fresca. I am not a big fan of fruit but I like fruit flavoured waters! Yum and what a nice fun refreshing treat for the summer. It would look gorgeous at an dinner party or summer BBQ. Sounds WONDERFUL!! And we sell giant polka dot beverage urns that would be PERFECT for this!! the watermelon one would so totally hit the spot... but, where's the vodka?????? Thanks for the recipe. This sounds delicious.